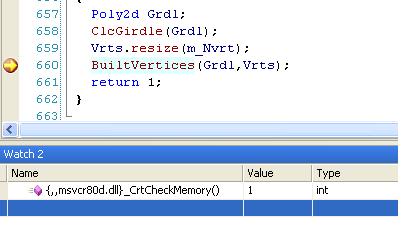 There are several ways to locate memory corruptions, but probably the easiest is to spread _CrtCheckMemorys around and pin the culprit (hopefully) in a binary search scheme. This requires recompilation at each search stage and thus can get tedious quickly. Just type it at a watch window, immediate, or even a QuickWatch – anywhere the expression evaluator can find it. You can probably pull similar stunts with many other CRT debug routines – just not those that directly allocate/deallocate memory. Oh well. Maybe some day. 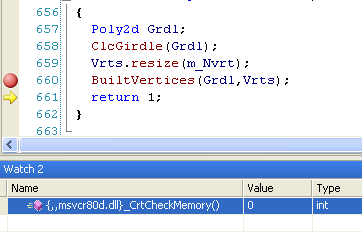 This entry was posted in Debugging, VC++, Visual Studio. Bookmark the permalink. What a fantastic trick, this made my day, thanks a lot for sharing!